The University of Pennsylvania is nestled in the historic and vibrant city of Philadelphia – America’s fifth largest city. Hailed as a “city of neighborhoods,” Philadelphia offers much to explore, including a thriving arts and culture sector, delicious and diverse dining destinations, iconic historic sites, and one of the Nation’s largest City Park systems. Located in the heart of the University of Pennsylvania's Ivy League campus, the School of Social Policy & Practice is known for its interdisciplinary focus as well as its emphasis on leadership for social change. One Mission The School of Social Policy & Practice contributes to the advancement of more effective, efficient and humane human services through education, research and civic engagement. The passionate pursuit of social innovation, impact, and justice is at the heart of the School’s knowledge-building activities. One School For more than 100 years, SP2 has been a powerful force for good in the world, working towards social justice and social change through research and practice. Students are encouraged to embrace the interdisciplinary opportunities that SP2 and the University of Pennsylvania have to offer. One World Students come to SP2 from around the world to learn how to be powerful forces for good. After earning their degrees, alumni take their gifts, skills, and knowledge to all sectors of society, connecting the dots between issues that are local and international, intimate and institutional. The School is proud to offer five degree programs: Master of Social Work (MSW), Master of Science in Nonprofit Leadership (MSNPL), Master of Science in Social Policy (MSSP), Clinical Doctorate in Social Work (DSW), and PhD in Social Welfare. Throughout its 108-year history, the Master of Social Work (MSW) program has emphasized the integration of field and classroom learning. It draws on 600 different human-service agencies for student field placements. MSW students are able to concentrate in clinical practice or macro practice. Fully accredited by the Council on Social Work Education, the MSW prepares social workers to develop and provide services to individuals, families, groups, communities, and organizations at local, national, and global levels. The MSW program offers opportunities for full-time and part-time study. An Advanced Standing option as well as an Employed Practitioners Program is also offered. Eleven dual degree programs are offered. These degree programs include: Social Work/Juris Doctor (MSW/JD); Social Work and Bioethics (MSW/MBE); Social Work and Business Administration (MSW/MBA); Social Work and City Planning (MSW/MCP); Social Work and Criminology (MSW/MS); Social Work and Public Administration (MSW/MPA); Social Work and Public Health (MSW/MPH); Social Work and Education (MSW/MSEd); Social Work and Social Policy (MSW/MSSP); Bachelor of Arts and Master's degree in Social Work (BA/MSW); Social Work and Nonprofit Leadership (MSW/NPL), and MSW/PhD in Social Welfare. The Master of Science in Nonprofit Leadership (MSNPL) offers full-time, part-time, and hybrid online options for completing the program. This graduate program is designed for professionals who want to assume leadership positions in nonprofit or non-governmental organizations. Three dual degrees are offered, including: Nonprofit Leadership and Juris Doctor (NPL/JD), Nonprofit Leadership and Public Health (NPL/MPH), and Nonprofit Leadership and Social Work (NPL/MSW). 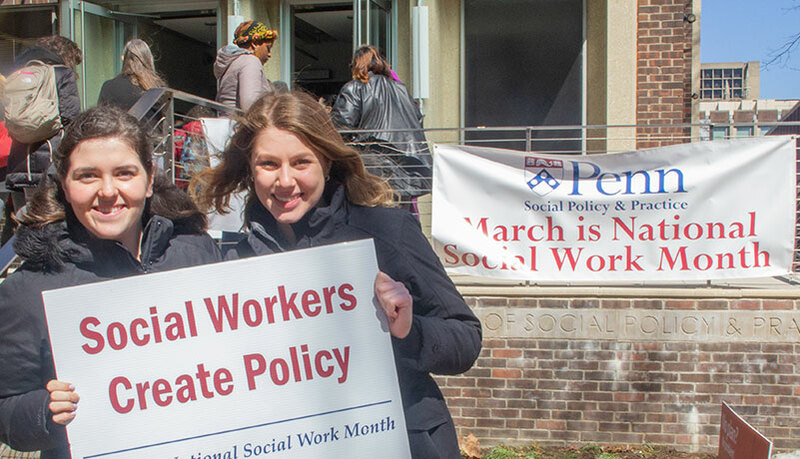 The Master of Science in Social Policy (MSSP) offers both a full- and part-time option, as well as four dual degree programs. This program prepares students for leadership positions in policy leadership positions in government, philanthropic foundations, research institutes, and more. Students learn to use policy to increase equality, promote equity, and forge social change. The MSSP + Certificate in Data Analytics also provides students with core training and skills in the conceptual foundations of data analytics, programming of data structures, applications of machine learning and predictive analytics, spatial analytics, and the data processing techniques for web scraping and data visualization for a broader public audience. The Clinical Doctorate in Social Work (DSW) is intended for clinicians with at least two years post-MSW experience who want to remain clinicians or teach clinical social work practice. Penn's DSW is an intensive online program that enables students to complete the course work and dissertation in three years, without career disruption. The PhD in Social Welfare is an interdisciplinary program that prepares students to be scholars, researchers, and leaders in the field of social welfare. Applicants Interested in SP2 Graduate Programs May Apply For Financial Aid Scholarships. The DSW program is a hybrid distance program and offers all the advantages of a world class learning community in a highly interactive, relational, accessible and convenient format. The NPL program is a hybrid distance program. The one year program begins on-campus with two (2) CUs and cohort building in the first summer. Students then take three (3) CUs in the fall semester and three (3) CUs in the spring semester through a combination of synchronous and asynchronous online classes. Students complete the program with two (2) CUs, capstone presentations, and a graduation ceremony in the second summer.